Celebrated in April-May, Thrissur Pooram is a major festival held in Thrissur. The rulers of erstwhile Kochi state, Sakthan Thampuran founded this festival. The highlight of this festival is its procession that consists of 101 bedecked elephants, which first assemble for the festivals in the Vadakumnatha temple. Along with the group of elephants, the procession includes spectacular fireworks and the Panchavadyam, 5 musical instruments, when played together, create soothing music. A 10- day festival, Pongala is organized at Attukal Bhagavathy temple, around 2 km from Trivandrum. The festival is attended by thousands of female devotees but men are not allowed in the vicinity of the temple. On this day, Pongala, a kind of sweet porridge, is offered to the goddess. This dish is prepared in a clay pot on open fire. Celebrated in the month of Kanni (September-October), Navarathri is one of the most prominent Hindu festivals. During the festival, the 9 incarnations of Goddess Durga are worshipped. Puja Veppu ceremony is performed on the day of Durgashtami, where books are worshipped. On the day of Mahanavami, Goddess Saraswati is worshipped. On the day of Vijaya Dashami, it is break-up time for the Pooja and work and study are again restarted. Celebreated in January, Makaravillakku is held at Sabarimala in Pathanamthitta. This festival is attended by thousands of devotees from all over South India. Lord Ayyappa, also called Dharma Sastha, the worshipped deity in Sabarimala is offered prayers during the festivals. He is seen as a representation of unison between the Vaishnavites and the Saivites. 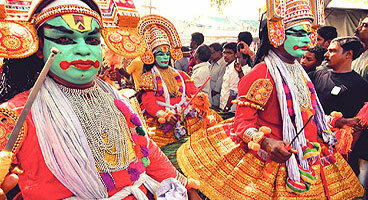 Celebrated in the month of January, the Kerala Village Fair is organized at the Kovalam beach. During this 10-day festival, a scene of a village is recreated. Nalukettu, a recreation of traditional house of Kerala is the main attraction. The fair includes several stalls, selling interesting stuff like coconut shell items, bell metal mirrors, woven clothes, handicrafts, spinning wheels and handloom for making Khadi and more. In the evening, there are dance, music and martial art performances. Celebrated in February-March, Aluva Sivarathri is held on the banks of Periyar River in Aluva. This day is celebrated to remember the occasion when Lord Shiva had consumed poison to save the destruction of the world. On the day of the festival, the devotees stay awake for the night and read Holy Scriptures, puranas etc. After returning to their homes during dawn, they perform Bali, a ritual. Several cultural programs and a trade fair are also a part of this festival. Celebrated in April-May), Vishu festival is celebration of the astronomical New Year day by the Hindus in Kerala. There is a common belief that the first object seen on this day has a great influence on the fortunes of the subsequent year. The important ceremony of Kani Kanal include things like new white cloth, gold ornaments, cadjan leaf book, flowers of the Konna tree, some rice, halved coconut, halved jack fruit, yellow cucumber and 2 standing lighted oil lamps. Celebrated in the month of April by Christians all around Kerala, arrives soon after the Good Friday. The day is the celebration of the rebirth of Christ, the victory of good over evil. This festival is celebrated with a lot faith and fun and the Christians offer special prayer services in the church. 40 days before the Holy week of Easter, fasting and prayers are organized. Celebrated in the Dhanu month (December-January), at Thiruvathira, the Thiruvathira festival is women's festivals. On the day of the festival, people visit temples of Lord Shiva. There are several legends behind the origin of the festival. The main aim of this festival is promotion of happiness and harmony. The dance form of Thiruvathirkkali is also related to this festival. Chandanakudam Mahotsavam is a colorful Muslim festival, organized in the remembrance of Bee Umma, a saintly lady whose tomb is placed in Beemapally, near Trivandrum. On this day, the devotees bring money in earthen pots that are decorated with flowers, sandalwood paste and incense sticks, in the form of an offering. 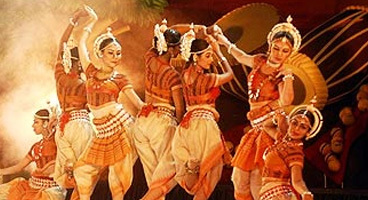 Organized at Nishagandhi Open Air Theatre, Kanakkunu Palace grounds in Trivandrum, Nishagandhi Dance and Music Festival is a celebration of Indian classical dance and music. There are various kinds of performances during the festival including a Jugalbandi, Kathak, Bharatnatyam, Kuchipudim Odissi, Manipuri, Mohiniattam, and more.